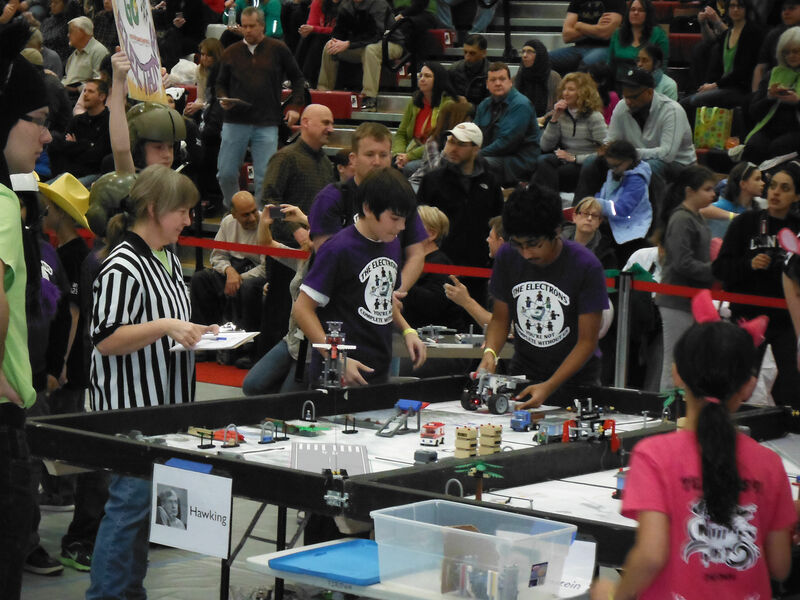 All Middle Schools in the Olympia School District fielded Varsity Robotics Teams for this year’s international FIRST LEGO League (FLL) competition. Just like varsity sports, these after-school teams are an opportunity for experienced students to take their Robotics, Science, Technology, Engineering and Math skills to the next level. At the FLL Spanaway Regional Qualifiers last month, both Jefferson Middle School teams qualified for the Western Washington FLL Semi-Finals held in Mill Creek on February 9. At this event, one Jefferson team, The Electrons, earned a berth at the FLL Washington State Championships, held this past weekend at Central Washington University in Ellensburg. 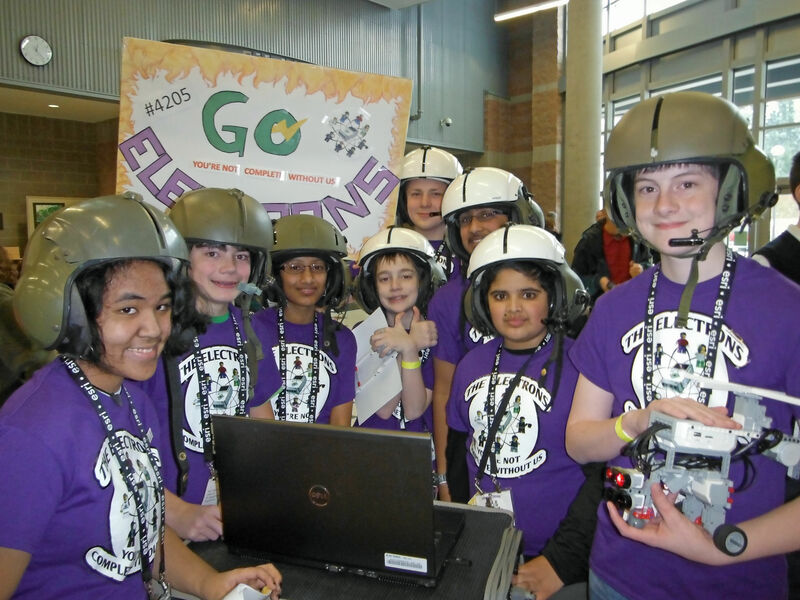 Out of the 591 FLL teams in Washington State and British Columbia, only 55 earned the right to compete in Ellensburg. The Electrons went toe-to-toe with these top tier teams, demonstrating their hard work on this year’s challenge, Nature’s Fury. The teams were required to design, build and program autonomous robots to complete several time-sensitive Robot Game missions, as well as research, develop and present their Project solution to an engineering problem. This video, hosted by the game designer from U.S. FIRST, describes Nature’s Fury Robot Game. This video shows a robot from Germany (FLL is a worldwide competition) completing several of the Nature’s Fury missions. The image on the right shows the Electrons during the first of three rounds in the Robot Game at the Washington State Championships. The process for developing the research Project for Nature’s Fury is described in this video. The Electrons chose forest fire fighting as their research project. 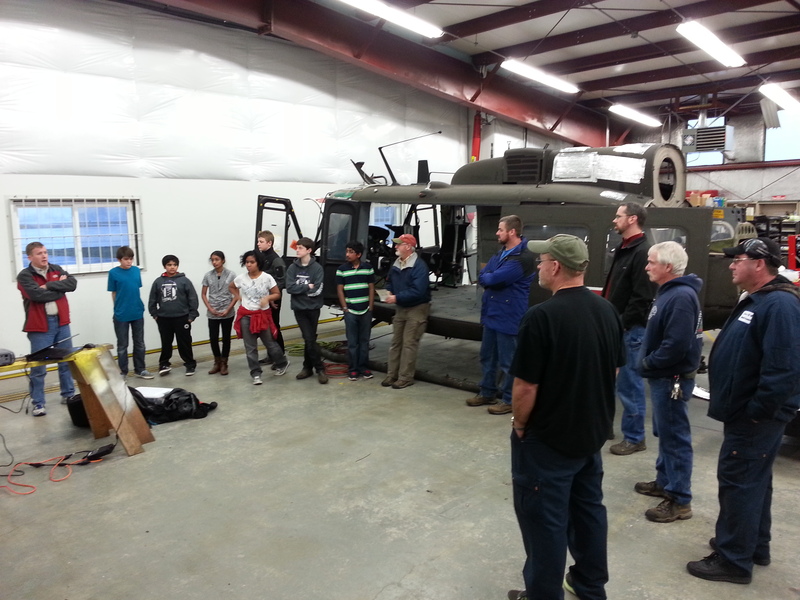 The image at left shows the team meeting with the Department of Natural Resources helicopter fire fighting crews at their Olympia Airport hangar to explore ideas for their innovate solution. After refining their project, the Electrons met again with several teams from DNR to present their results. The DNR communication team summarized the Electrons presentation for this DNR “Ear to the Ground” article. 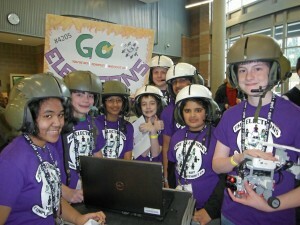 Unfortunately, Washington State did not win a lottery slot to send a team to the FLL World Championships this year, so no teams from Washington or B.C. will advance beyond this competition. As a result, the Ellensburg trip marked the end of the extremely exciting and intense FLL season for the Electrons. Congratulations to all the students and coaches for an outstanding and memorable season.